Ranchers fighting comeback of a predator that's good for the land Grizzly 399 finds a new mate, meaning kids have to fend for themselves. The took this picture in May 2008. It is a huge nearly empty valley. 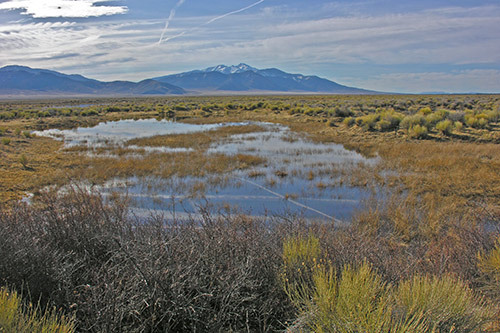 Like most Nevada valleys, the rangeland is damaged by cattle, but it has many springs and ponds, The water rights have been bought by the powerful Southern Nevada Water Authority. SNWA is spending billions to pump the ground water out of many Nevada valleys to send it to Las Vegas. When this happens the valley will turn into pure desert (as in sand dunes). Springs in Spring Valley. Photo March 2007. Copyright © Ralph Maughan. This photo was taken further to the north than the previous photo. In the meantime, SNWA could at least rid the valley of cattle. They seem to have purchased all the ranches and are paying White Pine County, NV monies in lieu of taxes. No doubt water is tomorrow’s oil. This is particularly true in the West, where many aquifiers and rivers are being drained dry quickly by all the interests laying claim to the water one way or another. In many parts of the West, water issues will be a crisis in the coming decades. I don’t see much that will or can be done about it, by anyone, either. However, that is true of many of our environmental problems, unfortunately. Water doesn’t have to be the next oil. We just need to learn to conserve. Irrigating golf courses in the desert SW and filling fountains in Vegas is not my idea of “wise use” of our water resources. I wish you were correct. I really do, but the truth is quite opposite. Climate change is drastically altering the precipitation patterns across the West, and these trends will become stronger and extend into the future. The long and hard droughts across the West for the last decade or so is not an anomaly. They are the predicted effects of rising global temperatures. The west cannot simply conserve their way out of this. Please check these articles out. They are very well-written and informative on this subject as they pertain to the Colorado River. It seems quite representative of the West’s dilemma. did you know that it takes 2,500 gallons of water to produce 1 pound of beef? and it seems to me wildlife ought pretty much have a monopoly on the “first in time, first in right” standard. The situation regarding the SNWA is different than the old western water law of “use or lose it” (prior appropriation doctrine). SNWA is reaching out in all directions to capture water to continue the growth of a city, which by many standards should not exist in its current form. And even worse – SNWA under Pat Mulroy now holds a very large number of public lands grazing permits. All the “‘we love our lifestyle” ranchers sold out when the price was right – and so did the big corporate types like El Tejon – where domestic sheep grazing under this permit has killed off nearly every bighorn in Great Basin National Park. 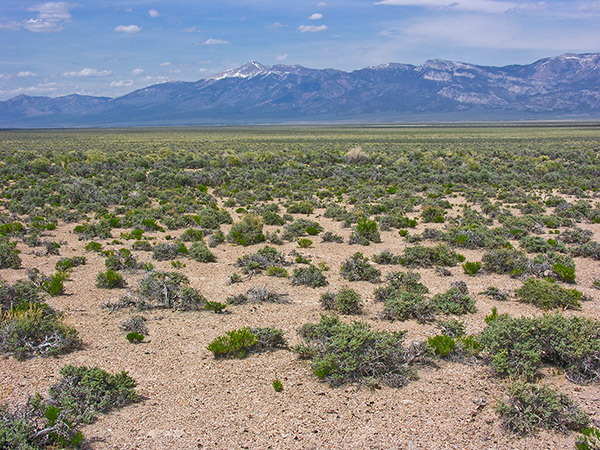 SO – our tax dollars are going to support SNWA’s desertification of public lands (both Ely BLM and Humboldt-Toiyabe Forest) with herds of hooved locusts and bovines. PLUS SNWA and Mulroy subscribe to the rancher myth that junipers and pinyon pine are water-sucking weeds – and so to milk more drops of water out of Spring Valley and other desert Basins – agencies are promoting large-scale “treatments” of public land pinyon-juniper and even sagebrush. Wouldn’t want a transpiring plant to get in the way of well-watered Vegas casino fountain display. AND the water corridors to de-water much of the Great Basin – those came about through Harry Reid’s Lincoln County quid pro quo Wilderness Bill. It should not be forgotten that some conservation groups knowingly enabled these pipelines – to win the “glory” and big PEW and other foundation funds – associated with bagging wilderness … Without burying the Vegas water corridor pipelines deep in the bowels of a Wilderness Bill 3 or so years ago – this would not be occurring. Is there any organized opposition to this? I did read that folks in Utah were worried about their air quality after Nevada has been turned into pure desert. Yes – there is an organized opposition – to the water grab – but a big uphill battle. And part of the opposition is aimed at supporting ranching. When in reality retirees have been moving to places like Ely for quality of life – and a few retirees make up for any economic value of ranching. now. Maybe Harry Reid will be replaced in his “leadership” role, exposed for land deal shenanigans, something – and go away. That would help some. Nevada right now is ground zero for ALL Kinds of corridors – SWIP, Westwide DOE utility corridors – and some awful near straight-line natural gas corridors. Including the Ruby gas pipeline, and an El Paso gas line – Sierra something (Blanco perhaps – I am forgetting it now). The Ruby gas line corridor would rip right through or by Sheldon National Wildlife Refuge. On top of this all – there is the Bush Iraq misadventure-US economy collapse enhanced price of gold, copper and other minerals stoking a mining boom ripping into a whole lot more country in NV. AND if that was not enough – there is talk of hundreds of thousands of acres in NV BLM desert tortoise habitat being bladed flat and plastered with solar panels – rather than providing rooftops in cities (LA, LV) with solar panels. And BIG windfarms are being planned that will wipe out the some of the southenrmost remainng sage-grouse populations – like at Table Mountain near the NV-UT border. The “renewables” (not) craze is poised to take out whatever country mining, corridors and de-watering has not. In nearly all of these proposals – that would exploit or rip apart public lands – if one follows the money trail- it gos back to BIG foreign-owned entities in many cases. These huge public land “renewable” energy developments (wind, solar) – they are the same old cast of often foreign energy profiteers – BP, Shell, other big energy companies (sometimes with a local front LLC or something) – maneuvering to control energy of all stripes. Instead of local de-centralized energy and conservation – the rush is on right now to stake a claim to just about everything on public lands so that big corporations can build giant facilities in the middle of nowhere – and continue to control and manipulate the Energy market. – a la Enron. And of course the mines that are ever-expanding in NV are often foreign-owned entities – like Barrick, Newmont, all the others – who for virtually nothing – they can tear up an entire public land mountain range. There is a molybdenum mine proposal (New Hope) going to take out a whole lot of country – and ground water – near Eureka/Roberts Mountain. New Hope has been been busily off in DC lobbying the highest Bush admin Interior officials so that they can get their way. Good-bye sage-grouse there, too. At some point, the SNWA’s de-watering will meet all the mine de-watering/pumping – and you are right – Utah will be the dust storm downwinders. Bottom line: Remote areas of Nevad public lands are about to be industrialized and gutted beyond belief unless some sanity in energy, water, wildlife conservation and politics prevails. There is a big difference compared to Owens Valley, however. KT would probably know for sure, but I’d venture that SNWA wants to dry about perhaps 20 or so valleys. What has the development and settling of the Miami area done to the Everglades ecosystem? What has NYC done to the Hudson River? Have you fished it lately? What has Washington DC done to the Hudson river area? How about what Washington DC, Philadelphia, and Baltimore have done to the Chesapeake watershed? How about what Wilmington, De has done to the Delaware river? Anyone want to fish or swim in that river? I think I have made my point. Every city in the U.S. has done incalculable damage to the direct environment. I would say that Las Vegas is like every other city in the U.S. in regard to it’s negative effects on the environment. And what can you do about Las Vegas? Forcibly move millions of people and shut the city down? Nope. What is going to happen is what is happening: our cities will continue to absorb and use our nation’s natural resources. Just like they have been since the founding of Jamestown. I meant to add that uncontrolled growth is one of the basic economic extensions of capitalism, and our cities effects on our environment (air quality, water abundance and quality, sprawl, deforestation, etc) will only increase as our population gets larger. No government officials in the U.S. (whether state, local, or Federal) will ever leave a natural resource alone that is required for human needs or economic requirements. The bible tells us that is why those resources are there. Doesn’t God instruct us to hold dominion over the land? And to use the world for our human needs? As enviros, aren’t we fighting our nation’s economic model and our nation’s dominant religion? Little wonder then why we rarely win. Every city has NOT done “incalculable damage to the direct environment.” Had they, we would all be dead. What can be done about Las Vegas is to not allow it access to more and more water. No one will have be forced to do anything. The city will not be shut down. People will make rational changes in response to the alternatives, costs and benefits. The city may stop growing or grow in a different way. I agree with Ralph. I live in a small city (ca. 80,000) in the Southwest. In the past few years we have seen some small but significant changes in the business as usual, development at all costs approach to growth. We saw one huge development put on indefinite hold due, at least in part, to a failure to adequately address water and other infrastructure issues. We watched two new city councilors and a new mayor get elected on platforms of smart growth and sustainablility. One of those city councilors recently arranged a major city council work session, open to the public, on sustainable development (including water, alternative energy, etc.) at city hall. We expect water, public lands, wilderness, and even wildlife issues to play a part in state and local elections this fall. I, for one, am not willing to roll over and give up in the face of the monumental threats to our Southwest lands and wildlife. I wish the citizens of Nevada well as they continue to cope with the challenges they face. It may be easier for us to deal with the challenges because we’re small, but with dedication, hard work, and good will, the residents of Nevada and Las Vegas should be able to make real strides in improving the situation there, too.